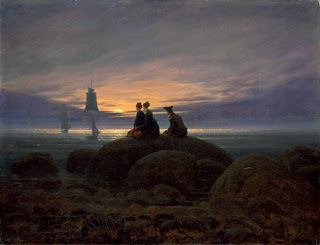 As in many of his other pieces, this Friedrich painting reflects his intense focus on both landscape and the individual. While there are indeed three figures in the foreground, each is absorbed in their own thoughts, inviting the viewer to read each of them as solitary. There is an additional emphasis on the figures' relationship to the greater space, as seen often in Friedrich's work. In this painting, it is the trio that first grabs the viewer's attention, as they are strongly silhouetted by the setting sun. The treatment of the colors of the sky, and the diagonal lines of the clouds draw the viewer's attention then back toward the ships, and eventually into the deep distance, stressing the overwhelming space and grandeur of the ocean scene. Being as the ships are much the same size as the figures, it emphasizes even more the relationship of man to the greater environment, and forces the viewer to contemplate their own role therein. This is a really interesting painting I have yet to see by Friedrich. It blows me away how many times Friedrich can get away with this composition. Another reason to be inspired by his pieces.